Your comments on the London under attack programme. Due to the high number of e-mails we get we cannot guarantee to publish every single message we receive. We may also edit some e-mails for legal reasons and for purposes of clarity and length. The views expressed on these pages are not necessarily the views of the BBC. The e-mails published will be reflective of the messages we have been sent. Congratulations to the BBC in highlighting the failure of communication from the government on the risks we face from terrorist attack. I hope that this will be followed up with programmes which offer more information and practical advice to the public. Panic is caused by ignorance, not programmes like this. How dare you bleat on about the wall of silence. The government does not have to respond, or aid you in the making of a documentary on something that has not taken place. It used to be that documentaries were a record of events, told a story, or put an event into context - but this time you are making up the story, and have extended beyond that to make yourselves and your documentary the story. Get off your high horses and take some kind of responsibility for your actions. Just like the Daily Mirror, will you wait until after you do the damage before you think about what you are doing. And, don't bleat on about your social responsibility, this is about ratings - and hats off to the government for not playing your game. Presumably you did not intend to set the whole country into a state of panic, but that is what you did. My son phoned me from London, absolutely terrified. His friend had received a phone call from her mother who thought London was under attack, so she panicked and it snowballed. I said I thought it was a hypothetical situation on Panorama, but he was convinced otherwise. Anyone tuning in part way through without prior knowledge of the programme content, seeing such frightening headlines was bound to think it was really happening. I have just watched the programme. 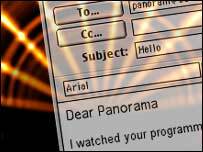 If Panorama want to make a serious point they should make a serious programme, not a dramatised documentary. Britain is as well prepared as any country is. However, much more needs to be done, we are one of the best countries in the world and we should have the best. The emergency service have my full trust, but they need more equipment, training and resources. I feel this government is doing a good job, yet more can be done. Well done BBC on bringing all these facts to our attention. Maybe you could back this up by working with the government to get this country working as a single unit to combat terrorism. What are Panorama trying to do. Run a terrorist training school explaining how best to attack London? What a totally irresponsible programme. Anyone coming home and switching on the programme and seeing the mock news could think that it is real and this could cause distress if they had friends or relatives in the area. You have a number of "experts" in the studio giving terrorists excellent information about our weaknesses and how to cause greatest damage. I was absolutely amazed at the seeming stupidity of the programme planners to broadcast this type of programme in this way. What are Panorama trying to do. Run a terrorist training school explaining how best to attack London? I know from just the introduction to this programme that:- A simple and effective way to bring London to a halt and to kill at least 300 people would be to target three underground trains. Blow front and back to stop the emergency services getting to the injured. If Panorama want to highlight shortcomings in our national preparation for a terrorist attack to the government then there are better ways than this. When the government needed some help creating an imminent feeling of danger to justify war, identity cards and detention without charge or trial, then they seemed all too happy with this kind of 'disaster documentary'. I think it was a great programme, and it saddens me to learn how un-ready we are for such an attack. A side comment to those who thought the broadcasts were real, can you not read the clock on the screen? Also, I think if it had happened, it would be on every channel a lot earlier than 2200. I can not believe how irresponsible you are to screen this like a true news service. This, so called, reality programme, should be flagged up as such. The scenario you portray is such a serious possibility that it is totally irresponsible of you to screen such a programme without warning that it is such. As a citizen, I'd like to know why asking questions about government reaction to terrorist acts and 'thinking outside the box' should be regarded as irresponsible. Terrorists don't do things by the book. They'll be thinking BIG. They'll think about creating maximum carnage, disruption, and the greatest revenge. These are not reasonable people when they're happy to kill themselves and take as many people with them. How do you train people for something that no one has ever dealt with before, and that we don't know the full implications of? Who trains people? It would be like the blind leading the blind! Having just watched this evening's programme I am filled with horror. I already have been apprehensive about using the underground and thus spending over £100 per week travelling within central London from home to work. The issues discussed prove to me that not only are we a target, but we are certainly not in a position to minimise casualties. The government have a responsibility during our 'war on terrorism' to protect its people and prepare us adequately against such attacks. I was horrified, but pleased to be told the truth about how unprepared London is in the event of a major terrorist attack, but also alarmed that those terrorists now know we have not just a few, but many, many, Achilles heels to exploit. The government had better do something fast. I travel on the Piccadilly line everyday and the idea of a blast down there is absolutely terrifying. Firstly well done to the BBC especially the use of the dramatised news reports. My biggest questions are why aren't there more helicopters for the ambulance service, and why on earth don't the radios work between the different emergency services - don't we live in the information age after all? I am the Chief Executive of Staffordshire Ambulance Service. I can honestly state that we have been given adequate funding to train and equip our staff to deal with major incidents whether conventional or including CBRN. We train all new staff entering the Service and all those attending Technician and Paramedic training as well as carrying out no notice exercises. In the event of an incident in London as portrayed in your programme we would deploy in mutual support immediately we became aware of it and before we were asked to respond. Other NHS Ambulance Services would do likewise. I accept that an incident in London would present a significant challenge but there would be little excuse if the emergency services failed to respond effectively to such an event. Being an ex soldier and involved in sending military helicopters and support to previous major incidents such as Lockerbie and Kegworth, I would be surprised if the emergency services were not supported by the military within hours. Unfortunately, the programme neglected to research what had been done and reinforced the negative. We fortunately have much greater expertise and capability than the programme cared to show. I am not aware of any country which is better prepared. Of course, we could and we should continue to strive to be better prepared. Tonight's programme was very irresponsible, and not for the first time recently of a BBC production. If the government and most of the authorities did not wish to take part then maybe you should ask, whether you should actually produce such a programme. Especially as you are allegedly the 'national' broadcaster. I don't think that any of us know how we would deal with a situation of this nature, I work for London Underground and we tend to deal with the issue in a pro-active manner and try to prevent these situations occurring in the first place, hence the many advertising campaigns you see on the tube today and the increased police presence within London. I don't think that the programme raised many issues that haven't already been discussed in most broadsheet newspapers already. When I say that, I don't mean that the programme was of poor quality - far from it. My point is that I think that the government's branding of this programme as "irresponsible" is consequently totally unjustified. I think that a programme such as this is vital to make people aware of domestic issues rather than spending their time focussing on foreign policy. The argument that this will give ideas to terrorists is ridiculous. Look at all the Hollywood blockbusters that can give terrorists all kind of ideas. This programme is tame by comparison. One negative comment I would like to make is that the acting was occasionally "wooden". That detracted from the authenticity somewhat. I remember watching the equally splendid programme "The Day That Britain Stopped". The acting there was totally believable. With Panorama it was quite easy to tell that the programme was fictional, unlike last year's docudrama. Overall - well done BBC. Fantastic programme, and not at all irresponsible. I can understand why the government were not happy about this - because the country is so ill prepared, and some of the blame is on their shoulders. With the current alleged abuse of people in Iraqi by British and US solders, this programme brought it home that we have even more reasons to be afraid of terrorist attack, and we couldn't cope! This was a timely reminder of the dangers we face today, and, I hope, will shake us out of our complacency. My only complaint about the programme was its lack of continuous on-screen notice that this was a simulation - people (especially the elderly and mentally vulnerable) turn on the TV at any time and could well have been very distressed by what was being reported. The refusal of David Blunkett to comment on the matter was deplorable. I have just watched Panorama's "London Under Attack" programme and I can understand why the government refused to co-operate; it doesn't want its shambolic disaster recovery 'plans' to be exposed. I was reminded of the laughable Civil Defence arrangements against a possible Soviet nuclear attack during the Cold War. Panorama exposed exactly the same lack of government preparedness and planning, and refusal to spend sufficient money. And why? Because the government knows that it is impossible to protect we ordinary people, so why bother to try? The great and the good will be safeguarded and protected but we peasants will have to fend for ourselves, because to our political masters we are all expendable! I dread to think how many of our vulnerabilities we have just given away in this programme. Was it necessary to state how unprepared we are for such an attack on television? I am a first aider and the programme was great at showing all the gaps in the system from the moment of the attack till someone can actually take action to control the situation. I would like to know what plan of action is available to the public as to the best way of coping with large scale disasters, when people know what to do there is less panic and more help. Are there mass meeting points? where? How many can they hold? What do you need set up for the emergency services ? The public is at its best when doing something that can help. I think it was totally irresponsible not to make it clear by a subtitle that your news broadcasts tonight on the programme relating to a terrorist attack in London were fictional! This caused great distress in our home when we turned over in the middle of the programme and thought a terrorist attack had taken place in London today. The programme on a possible terrorist attack on London was one of the best things I have seen on TV for a long time. Very informative and thought provoking. I'm sure people will be talking about it tomorrow and it will be a topic of conversation for a long time. The BBC is asking the questions that the opposition should be asking. Well done. The programme was thought-provoking, and appeared to be well researched. It highlighted many potential shortcomings and areas for concern in terms of how the emergency services would be able to react, in terms of training and capacity issues. Sadly, the government's lack of input due to their concerns of the programme being "irresponsible and alarmist" only project an image of "we know best", which may be the most alarming thing to emerge from this. It seemed a shame that the programme only ran for one hour, as I got the impression that the participants' views and opinions could have filled a much longer programme. A well presented programme. Overall, I was most impressed with the professional competence of your "team". I sincerely hope that the BBC continues to present such programmes. Government does, I think, underestimate what a well informed population can do to assist in such situations. Do the public realise that if the pay agreement is not settled that Firefighters will not be manning the CBNR vehicles? Well done Panorama on an excellent programme - let's hope the government take the issue more seriously, rather than just criticise the programme makers - and there can be no doubt that the programme was fictional, due to the camera shots etc - let's hope the government don't try and turn this into an anti-BBC "alarmist" argument. Let's hope that some of the findings (eg lack of compatible communications between the emergency services) are now acted upon. What were you thinking with tonight's Panorama? Did you not think of all the people that would tune in and think something dreadful had happened in London? There was no message at the bottom explaining that it wasn't real, and the acting in the scenes was awful. Whose idea was this? The programme was too realistic - anyone turning on in the middle might think there was a real terrorist attack in London. Why not flag this with 'Panorama: Simulation' in the corner? It concerns me that a government which can justify spending millions fighting an unwanted conflict in Iraq, can then ignore the worries of the populous and refrain from making the correct preparations for the inevitable attacks that we face. Nobody in your programme made any comments as to where or how any of the dead were to be stored. As a funeral director this would be one of my main worries - upon receiving the bodies into my care, would they be in a fit state to show their loved ones? Your show was brilliantly educating and interesting, and even had me in shock when I turned on the TV, only to find there was a news report about a chemical attack in London!! It's about time a programme like this highlighted the lack of training in cross emergency services in the event of a terrorist attack as there is none. You are given a chemical suit, showed how to put it on and how to scrub off patients and that's it. Our radios in the ambulance service don't work well at the best of times. We are unable to have cross service communications due to money (lack of) I think that when/if there is a event like the one shown tonight all this will come out in the open and serious questions will be asked. I think as a country the UK is a very easy target due to the short falls shown on this programme tonight! Anyway that's enough moaning keep smiling! Sincere congratulations, BBC! The intense efforts of our current government to hinder the production of this docu-drama only serve to emphasise the reality; that nothing will be done to prepare for such an eventuality until it is too late. Thank you, and keep up the good work, BBC. I think this programme has been very irresponsible, I feel a terrorist attack is now more likely. The high level of realism is very bad taste. This is going to both motivate terrorists and give them ideas. As a serving member of the Armed Forces, I am utterly disgusted at our country's lack of preparedness for a 9-11 style attack. I just hope no terrorists, such as al-Qaeda were watching as they will now know our every vulnerability. No comment from the secretary of state - disgusting. May God be with us all! The panel stated that not enough training was given to Emergency Services, Underground Staff and Teachers. There are thousands of civilians who have had training in this type of emergency at least once a year. They are disciplined, trained in basic first aid and fire fighting, accustomed to wearing respirators. Why not use their skills? They are the ex-services civilians. As somebody who works in central London but also has a wife who is a nurse I was deeply disturbed by your findings in tonight's programme. I find it shocking that basics such as communications and equipment appear woefully inadequate. Many firemen and policemen died in New York on 9/11 because of exactly the same problem. The government needs to ensure that if a terrorist attack hit London, they could answer "YES" to the following question. Did we do everything within our power to ensure the safety of the British public? I think if there was an attack tomorrow the answer would be "NO"! Having just watched the London Under Attack programme I couldn't help thinking back to the broadcast of The War of the Worlds. Would people catching the programme half way through think it was real ? Very interesting scenario, and it is going to happen. The Dep. Chair of London Fire Service states that their I.R.U. (Incident Response Unit) could be at the scene of a terrorist attack within 15 mins. What she doesn't tell us is that it then takes about an hour to set up the decontamination units. This is due to the decision to store the equipment - which in itself is not all that heavy - in metal cages that weigh so much that they have to be removed from the wagon by a fork lift truck. Why don't the powers that be ever ask the people who have to actually use the equipment about the finer, practical details? Excellent programme that put into context the real threat we face in today's Britain, the government should stand up and take notice, before it's too late.